This was my only competitive entry in the UK GD 2003 and involved a serious amount of work. My intensions with the entry was to do what I usually do - complex conversions that really play on interpreting Blanchii imagery - but with a group of models instead of just doing a single miniature. 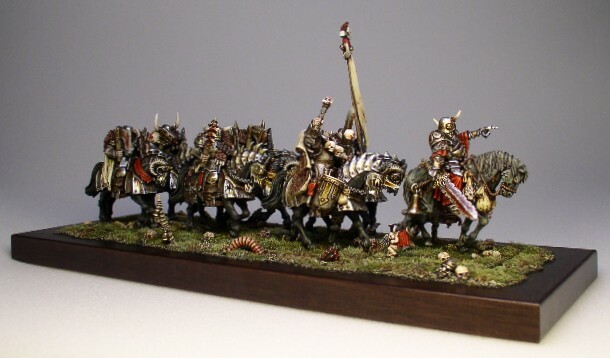 The Champion of Nurgle leading the cavalry is a character developed over a long period. Most obvious is the nurgle horn that has grown through his helmet which were used on both the Nurgle character in my 2002 duel entry and my Chaos Nurgle Giant. But after finishing the regiment I realized that the overall appearence of the leader mimics a tech priest conversion from 2001.